Finally, skirt steak gets the attention it deserves with this recipe. Skirt steak is most often used for fajitas and that’s about it. Don’t get me wrong – skirt steak is really, really good for fajitas and it’s my top choice for this and this. But such a flavorful cut of meat deserves to get fancy every now and again. 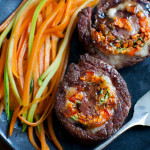 These vegetable stuffed steak rolls show that skirt steak can be part of an elegant dinner just as easily as a casual meal. Though these look impressive, they are surprisingly easy to make. Having a few key tools will help tremendously. When you buy the skirt steak, be sure it is one solid piece and not two pieces packaged together. Also, choose a piece that is at least one inch thick to make butterflying it easier. It will also help if you have a sharp long-bladed slicing knife. To make quick work of cutting the carrots and zucchini into julienne strips, I used this julienne peeler from OXO (not an affiliate link). It’s easier than getting out my large mandolin when I only have a few vegetables to cut and much faster than using a knife. The other two helpful items you will need are a meat mallet for pounding the meat out to an even thickness and some butcher’s twine to tie up the roll. A quick comment about the balsamic glaze – my husband and I loved the glaze and wouldn’t dream of skipping it. However, my kids didn’t like it. The sharpness of the balsamic vinegar was too much for them. My recommendation would be to serve the sauce on the side and let everyone drizzle on as much or as little as they like. While you’re julienning the vegetables for the filling, cut some extra to sauté with some butter and herbs for a side dish. You’ll have a fancy meal ready to serve in no time. Melt butter in a large heavy skillet over medium-low heat. Remove from heat, add garlic, and sauté until garlic is fragrant (about 30 seconds). Add rosemary, carrots, bell pepper and zucchini. Toss until vegetables are evenly coated in butter. Set aside. Be sure to have several 12-inch long pieces of butcher’s twine ready to tie up the steak roll (see Notes). First, butterfly the skirt steak by laying it flat on a work surface. Using a long-bladed slicing knife, cut the steak horizontally (parallel to the counter top) almost in half lengthwise, taking care not to cut all the way through or to make holes in the meat. Open the meat like a book to lie flat. Using a meat mallet, pound steak until it is an even thickness throughout and about 1/3 inch thick. With steak laying open and flat, turn the steak so that the grain is running left to right. Sprinkle Parmesan cheese evenly over the steak, leaving a 1/2 inch border. Gently press down on the cheese to help it stay in place. Arrange vegetable mixture evenly on top of the cheese so the julienne strips lay parallel to the grain of the steak. Set pan aside but do not wash it out. Roll up the steak jelly-roll fashion. You should be rolling the steak parallel to the direction of the grain. Tie a piece of twine around the middle of the roll. Working from the inside out, continue tying the roll every 1 1/4 inches, pushing any vegetables back in that have fallen out and tightening up the roll as you go. With a sharp knife, cut the roll into slices between each of the tied pieces of twine. Heat oven to 375 degrees. Line a rimmed baking sheet with aluminum foil. Wipe out the skillet used earlier for the vegetables with a paper towel. Add 1 tablespoon oil to the skillet and heat oil over medium-high heat until it begins to shimmer. Add about half of the steak rolls, cut side down and sear for 1-2 minutes. Turn steak rolls over and sear on second side, adding more oil as needed. Put seared steak rolls on prepared baking sheet. Repeat with second half of steak rolls. Place the steak rolls in oven and roast for 10 minutes for medium rare. Let rest 5 minutes before serving. While the steak rolls are roasting and resting, make the balsamic glaze. Melt the butter in a small saucepan over medium heat. Add shallots and sauté until they turn soft and translucent, 1-2 minutes. Add the balsamic vinegar, brown sugar and beef stock and stir to mix evenly. Bring the sauce to a boil, reduce heat and let the sauce simmer until it is reduced to almost half and thickens slightly. Remove twine from steak roll and serve with balsamic glaze. To calculate how many pieces of butcher’s twine you will need, measure the width of your roll in inches and divide it by 1.25. Round the number up and cut that many pieces of butcher’s twine – about 12 inches long each. This will give you an extra piece of string in case one gets messed up. Recipe adapted from Picture the Recipe. Your pictures and engaging conversation stimulated an immediate curiosity about this dinner treat. We gathered ingredients and put everything together following photo steps. Preparation really went smoothly and was relatively easy (although I am a tad clumsy with string and not allowed to participate). Beautiful final presentation. Steak was yummy. Glaze was “lick the pan” enjoyable. We used up our best balsamic (Texas Hill Country Olive Company – purchased at Whole Foods). Small vegetable added nice color and texture. I have not had any previous dishes with veggies inside the meat. Good work Nguyet. Aww, thanks so much Ken! Isn’t that balsamic glaze the best? The kids don’t know what their missing.